The past couple of weeks have been dulled a bit by rain. As someone who was raised in Colorado, weeks without sunshine take their toll. So, to mix things up and shake the funk that the rain was threatening we took a couple of weekend trips outside the city. We didn’t successfully escape the rain, but we did discover some new and interesting places! One Saturday, I got back from a run and Jonathan had the idea to visit a nearby city called Utrecht. I had never heard of it, but it turns out that it's one of the largest cities in The Netherlands. We packed up our stuff, rode our bikes to central station, fighting the raucous crowds in the centrum and hopped on a 45-minute train, with our bikes to the historic college town. It was adorable. Just adorable. It’s like a smaller, college-town version of Amsterdam with canals and small streets and shops and brown cafes. The town boasts a gothic church, its building started in 610, but was damaged in a storm in 1674, leaving the nave in ruins and separating the tower from the rest of the church. So, now, in place of the nave there’s simply a square. It’s a pretty interesting sight! While we were there, we spent a couple of hours in a different old church that had been turned into a brew hall. A huge, beautiful space, packed with people enjoying one another and the over 100 Belgian beers that the hall offered. A pretty good use for a church, I’d say. We also found the best brown cafe ever. What is a “brown cafe?” you ask. Well, I’ll tell you! When Jonathan and I first visited Amsterdam in 2015, we spotted cozy, dark, wood-interiored bars all over the city. Each had a very similar aesthetic, served similar beers, and many of the same snacks. There were always a bunch of locals, sitting lazily at a table, who had clearly become part of the place. These had to be part of some category of bar. We asked around, but no one seemed to know what we were talking about. It took me four years to find the name of the type of bar it was and this only occurred after ducking into a dark bar in Utrecht. Jonathan describes these bars as "somewhere that you would get your next D&D mission." Like I said, they are dark, with regulars that are basically part of the furniture, only a handful of beers on tap—always Heineken—and only sometimes have food. They all have candles everywhere and some of them have cats. Outside there are always a few faux-wicker chairs with people drinking Heineken out of thin glasses. They are perfect. The other thing that we discovered is that Utrecht is a huge board game town. We visited three or four board game stores while there. There is actually a street called board game row. If we were ever to move to The Netherlands, this might be where we would end up. A couple of weekends later, we took made a getaway to Brugge. We had visited Brussels in 2015, but only for an evening and had a lackluster experience. So, thought we’d give Belgium another try. This past Friday we hopped on a train and rode three hours to the little Belgium town in Flanders. The only impression I had of Brugge before arriving there is from the trailer of In Bruges, which is so cliche. I haven’t even seen the movie, but arrived expecting a moody, shifty, somewhat violent city. That impression was further reinforced when after arriving to the train station in Brugge and walking out onto the station square we witnessed a full-on fight, involving probably six or seven people, screaming, yelling, crying, a woman laid out on the ground, police nowhere to be seen, onlookers staring blankly at the scene. We watched the drama unfold for a few minutes in complete confusion. At moments we thought it was resolved and then someone would go back in for a punch, be pulled off, and then head back in for more. It was bizarre. I think the last time I witnessed a fist fight was in my early 20s at a sleazy bar in Denver and even then it was brief—a punch, a scattering of people, confusion, the end. We shook off our violent arrival after walking through incredible architecture and over charming canals on our way to our AirBnB. Brugge is incredibly walkable. Even though we stayed on what seemed like the edge of town, everything was within a 10 or 15 minutes walk. After checking into our place, we made our way to a perfect basement bar. Le Trappiste, to enjoy a slew of Belgian beers. The ceilings were low and vaulted. We then enjoyed a fancy dinner at a delicious place called Lieven. The restaurant is a bit more formal than our usual haunts, but the food was delicious and the service was really nice. The town was pretty quiet the first night we were there and our first few hours in the city were tame as we prepared for what I referred to as a day of debauchery and indulgence. 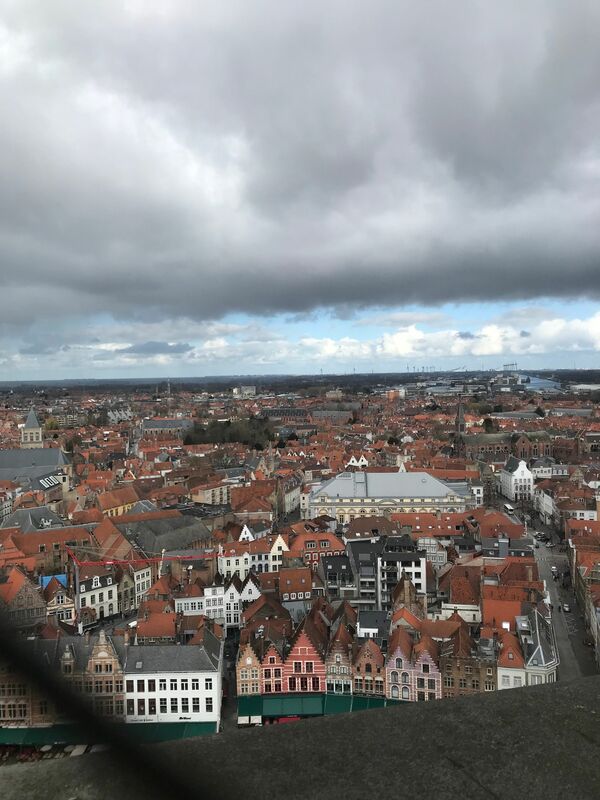 Belgium is home to many of our favorite indulgences—frites, chocolate, Belgian beer (and also waffles) To make sure that I did something good for my body before pouring poison into it all day, I went on a nice, albeit cold run around the rim of Brugge. The main area of Brugge is egg-shaped, which makes it pretty easy to navigate. And, they have a wonderful trail that takes runners, walkers, and bikers around the full circle of the city. I was really impressed with the infrastructure of the path and the parks along the way. After my mini-attempt at health (in all honesty, the run was more of a ramble, there was too much to stop and look at along the way!) we headed straight for sugar and started off our day with waffles. Then we made our way to the Saturday market where there were trucks and tents set up selling fruits, cheese, croquettes (this area of the world loves croquettes) and also tons of trucks selling rotisserie chicken. While checking out the market, a small, and somewhat half-assed parade started. I think it was in celebration of St Patrick’s day, but it also could have just been a bunch of friends who decided to get drunk on Saturday morning and march around the square. Hard to tell. We then made our way down the tourist trap streets where there were gobs of chocolate and waffle shops and horses clip-clopping their way alongside us, taking tourists on historical tours of the city. Honestly, maybe it’s just a result of the candy shops and horses, but Brugge reminded me a lot of a drunker version of Mackinac Island. While there were still cars the city clearly runs primarily on tourism and the abundance of chocolate and waffle shops was similar to the toffee and ice cream stores that line the streets of Mackinac. We indulged on chocolate pralines and spekulooos before heading to a brewery tour at the Halve Maan brewery, a fifth-generation Belgian brewery. 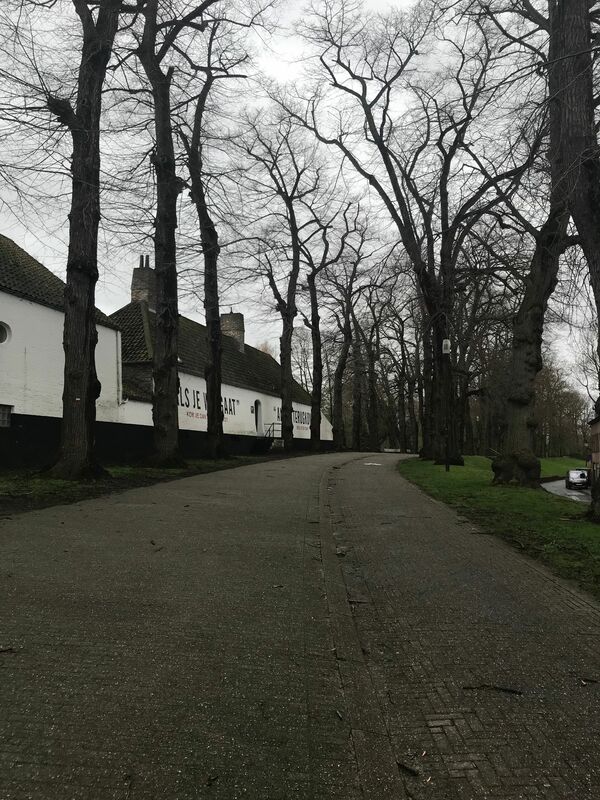 The tour took us through the original site of the brewery and shared how the brewery built pipes under the city of Brugge to transport beer to its bottling and distribution plant. It cost $4 million dollars to build the pipeline and $400K of the money was raised through a kickstarter. Pretty impressive! After seeing the brewery and learning about its operations, we enjoyed a Blonde, a Dubbel, and then shared a Tripel and Quad with a bunch of brits and an Irish couple. It was a good and tipsy hour or so. Fun fact—the Dubbel has twice the malt of a Blonde, a Tripel has three times, and a Quad has four times, making each of these progressively stronger in alcohol. The three beers pretty much wiped us out. After going on a fruitless search for frites, (the frites place was closed!) we shared a pizza and took a nap. After sobering up and regaining our energy, we went back out into the city to complete our search for frites. It was a delight to discover that there was a night-time kayaking race happening in the canals. We joined other onlookers and watched as individuals and pairs, in headlamps, paddled through the canals. We still have no idea what they were doing, but it was entertaining nonetheless. We found our frites, enjoyed a beer on a busy corner, sitting outside and people watching. IMO this is something that we don’t do enough in the US—have tables outside on corners for coffee and beer-drinking. It’s so enjoyable to sit out in the air, watching the bustle of people, even in the cold! On Sunday we spent our morning at the Belfry of Bruges, a medieval bell tower. We climbed 366 stairs to the top for a great view of the city and a chance to see the bells in the tower while they were charming. It was such fun! Then off we went to catch the train to head back to Amsterdam. Arriving to the station back “home” we made a quick decision to go to the first spot we had a beer in when we started our adventures together in 2015. Before our trip to Europe in 2015, Jonathan and I had only traveled domestically together. While those trips went well, traveling for two weeks outside the US was new to us and it was a bit of a test to see how well we really adventured together and if we could spend that amount of time together. It was a bit dicey at first. I got real cranky during the layover in Heathrow on our way from the states to Amsterdam and the Brits served Jonathan beans in ketchup for breakfast. Gross. But, once we arrived to our destination, and sat down to cheers to the beginning of our adventure, we kicked off years of incredible experiences together. It was nice to stop back into where our adventures started over three years ago. And, as we left to head to our apartment, the sun came out! There are few places quite so lovely as Amsterdam. After living in Barcelona, West Amsterdam was a shift, to quieter more standard days. Instead of the wild, humming atmosphere of El Born, we were surrounded by a reserved and practical energy, in a bookish city full of bikes.